Style: Neck Candy with Tessies. We all know I'm a fan of a big necklace, but sometimes I like to mix it up with more delicate pieces. I was sent this necklace last week from online fashion and accessories store Tessies (they also have a branch in Hull, not far from me!). 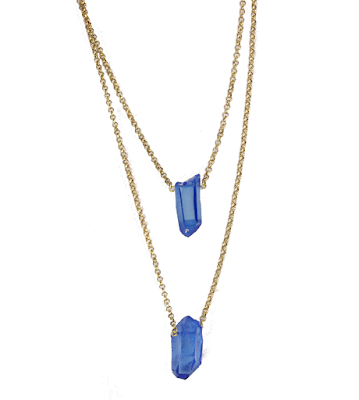 The 'Deep Blue Rocks' necklace is perfect for laid back sunny days like today. Michael was out on a job, so I had to rely on some selfies and a mirror shot, but I hope you get a good idea of just how pretty it is! What's your summer style like when it comes to accessories? Big and bold? Boho? Pretty and delicate? Oh and one more thing, keep your eye on Tessies, they are currently looking to procure a plus size collection, so watch this space!